2.2 Can you come back tomorrow? 2.6 Everyone's name is "David"
2.9 Is Kenny Baker in there? 2.25 What does it smell like? 2.26 What is that in "Enterprises"? 2.27 Who were they in Superman (and other movies)? These are quotes said by by characters in the movies that stood out to the hosts and have become incorporated into the SWM universe. When Han Solo tells Obi-Wan where they would be meeting (docking bay 94), Kenobi repeats it in a particular way that stuck out to Pete. Now whenever he is given a direction, such as "Take exit 12" he will repeat it à la Ben Kenobi, and then say "94", thereby forgetting the direction immediately. So if someone says "94" you say "94" back. Dangerous and disturbing, this phrase is. Another "quote" that stuck in Pete's mind was from The Empire Strikes Back (see ESB 8). When Han Solo is berating the Deck Lieutenant Tamizander Rey, he shouts "Deck Officer?! Deck Officer!". This is one of those "secret Star Wars quotes" which Pete is able to use without people necessarily knowing he's quoting Star Wars. As a follow up to his previous statement about the slim chances that Han and Luke would survive the frigid Hoth night, C-3PO meekly adds that R2 (who may or may not be the one who placed the odds of their survival at 725:1) has been known to make mistakes. From time to time. When Luke asks Ben why he lied to him about Darth Vader being his father, having said instead that Vader killed his father, Ben says that when Anakin "was seduced by the Dark Side of the Force ... he ceased to be the Jedi Anakin Skywalker and 'became' Darth Vader. When that happened, the good man who was your father was destroyed. So, what I told you was true... from a certain point of view." Pete and Alex had already outed Obi-Wan as a lying, deceitful, manipulative, murderous psychopath (right from his first appearances in Star Wars Minute); so "from a certain point of view" was clearly a euphemistic cop-out to cover up being caught in a lie. They now use it to justify outrageous claims and explain plot holes. Another one of those secret Star Wars quotes that you can use without it being super obvious that you're quoting Star Wars. Leia wonders if that mercenary Han Solo cares about anything... or anyone. Luke, sensing an opportunity to get on Leia's good side follows up (rather lamely) with "I care!" 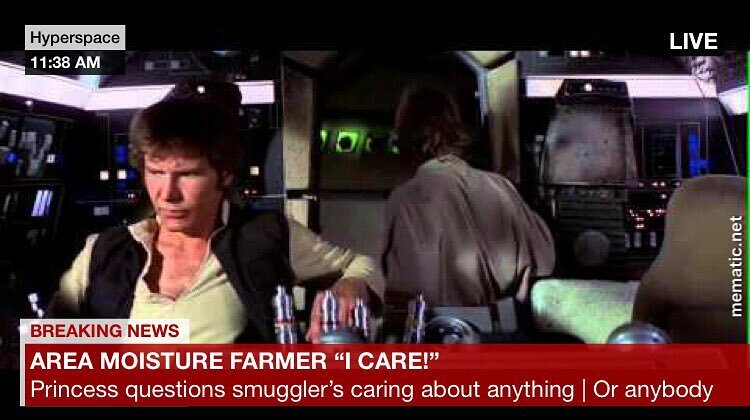 The trouble with using this quote is that people think you actually care about something, when you're just quoting Star Wars. If you aren't careful, you may eventually find yourself in charge of entire department that you don't actually care about. This quote was chosen as part of the 500th Article Extravaganza. This line, said by a young Anakin Skywalker in AOTC, was discussed in AOTC 10 in November 2016. The hosts suggested that the words could be placed on almost any well-known meme and would work. The internet quickly set about testing this suggestion and posted all of the resulting memes onto the SWM Listener Society on Facebook. The general consensus was the the words do indeed work on almost any meme. Now, when the characters in the movies do anything that is not obviously clear or logical, the action was simply "implied in their mandate". Old Ben hasn't heard the name of Obi-Wan in a long time. A long time. Several times during the podrace, fans of the Dug racer Sebulba shout his name as he passes. So now this is something Pete says all the time (see TPM 62). It has even been made into a shirt. This was referenced in an 8-DAY-GREEDO call during TPM 81. Among the many words that the Nemoideans say with their unusual accents, one that the hosts have singled out is "Senate." This has been adapted to the pronunciation of "seven" as "Sehhhhvehn" (TPM 7). See also: "Is it... legal?" After retiring to his summer hut on Dagobah, Yoda was pretty much done with training Jedi. When Luke Skywalker showed up to try to get him to come out of retirement, Yoda tried to get rid of him by using the excuse that Luke was "too old. Too old to begin the training." This is one Alex quotes all the time whenever something is too old. A fun extension of this quote is when something is another word that rhymes with 'old' (such as cold, bold, etc.) or if something has the opposite problem and is too young. Kenobi: "I understand you are quite a pilot yourself. Piloting and navigation aren’t hereditary, but a number of the things that can combine to make a good small-ship pilot are. Those you may have inherited. Still, even a duck has to be taught to swim." Luke can almost be forgiven for not knowing what a duck is, if not for the fact that, according to Wookieepedia, they can be found all over the Galaxy. The hosts have therefore attributed Luke's ignorance of ducks to a degree of cluelessness about life in general. Dr. Evazan: "You'd best watch yourself. I have the death sentence on twelve systems." Dr. Evazan: "You'll be dead!" This is one of Tony Consiglio's favorite quotes (see SWM 46). If anyone starts a sentence with "You'll be (doing something)," you answer with "You'll be dead!" Alex's pet peeve is when the expanded Star Wars universe (EU) uses the fate or actions of one character in the movies to completely define that character and, even worse, the character's entire race. Alex raises this peeve in a number of podcast episodes. During a normal week (as opposed to an All-Star Week) of recording, the same guest will appear 5 days in a row. The hosts like to pretend that the guests returns to the studio each day to record the next segment of the podcast, when in fact all 5 minutes are recorded back to back. This was nodded to during ESB 16. The joke carries over to welcoming the guest back when they "return" to record the rest of that week's minutes. As part of Pete's generally low opinions of the prequels, he notes that from time-to-time in those movies Lucas employs the tactic of having a CG character (e.g. Jar-Jar Binks) or robot "stepping in poop" to add some - usually misplaced - humor and slap-stick to the scenes. Given this, Pete is always on the look out for examples of this same tactic in the original trilogy and has identified quite a few. Since early in the original Star Wars Minute, Pete and Alex have attempted to say the show closing "Star Wars Minute" in unison, but have almost never succeeded in doing so. This has become a running gag that was addressed by Asterios Kokkinos during the live episode ESB 111. This has carried over into closing SWM:WE, where the hosts are unable to say "Star Wars Minute...Weekend Edition" in sync. An additional running gag is that whenever anyone on the show says the show closer (regardless of context), the hosts (usually Alex) will pretend that the show has actually ended, even if that would make the episode less than a minute long. When someone makes a terrible pun (the real groaners), one of the hosts (usually Alex) will try to end the show early by saying "Star Wars Minute". Two drinking games are discussed concurrently in SWM. Each week as part of the Roll Call of Heroes Pete reads the names of all the Patreon supporters. As the list grew longer, the hosts quickly noticed that there are a lot of supporters named "David," and since the list is usually in alphabetical order by first name, they all cluster together. Now, saying "David, David, David..." is a sort of stand-in for the Roll Call among the SWiMmers, and Pete will usually take a break for a glass of water or something before launching into the Davids. Alex has occasionally played on this phenomenon by suggesting that everyone change their Patreon names to "David" or some other name to force Pete to endlessly repeat himself. In Jabba's palace, there is an alien mollusk living on the wall with a long tongue that nearly licks C-3PO. His name is Ghoel, which sounds like "goal." Pete likes to shout his name like a football announcer. Whenever the conversation leans towards lightsabers with a gimmick, Pete always brings up what he believes to be the ultimate weapon in the Star Wars universe: a gun that shoots lightsabers. In ESB 96 the hosts also briefly discuss a gun that shoots Death Stars. Is Kenny Baker in there? In the Original Trilogy, the R2-D2 robot is operated from inside by little person actor Kenny Baker, but not all the time. In particular, when you see the three-legged R2-D2 (rather than the two-legged variety) he is normally operated by remote control. This led Joe Dator to pose the eternal question, "is Kenny Baker in there?" He asked this question about the R2-D2 robot, the C-3PO suit (which would be strange), and even about Kenny Baker himself to see if he would come out of his shell. In The Force Awakens, Kenny is credited as a performance consultant1, rather than playing R2-D2. From time-to-time Pete and Alex ask Tony Thaxton and his band to play the theme to the Jek Porkins Memorial Sexology and then comment on their performance afterwards, implying that it's played live. This started with former guest of the show Jordan White who works on the Marvel Star Wars comics, which are officially canon. All former Expanded Universe titles have been rebranded as "Star Wars Legends." Now, when you want to refer to something from the EU, say "legend has it that..."
The hosts will occasionally assign listeners various projects. The running joke is that Pete will usually take responsibility for completing these assignments himself. Alex saw Logan. He liked it. In SWM 97 Alex reveals that the temple that the rebels are using on Yavin 4 in Star Wars is a Massassi Temple. Pete takes an instant liking to the sound of the word Massassi and starts saying it as Massassay in a funny way and with elongated emphasis on the last SAY. Following this, the hosts say Massassay at every opportunity in SWM. This has extended to the pronunciation of Jedi master Saesee Tiin's name. It started off that Alex couldn't remember the aliases that Pete had set up on starwarsminute.com: starwarsminute.com/merch, starwarsminute.com/donate, etc. Each time Alex said it wrong, Pete had to make the new alias. This eventually extended to all domain names mentioned by anybody on the show, no matter how silly or frivolous. A big part of the host's memories of Star Wars come from their enjoyment of Star Wars toys. Some listeners have expressed frustration with what they consider to be too much "toy talk". As a result, whenever the hosts talk about toys they mention that people hate it. This is part of the SWM Drinking Game. The origin of this running gag was revealed on the We Know You Hate It When We Talk About the Toys special. Around Pete's office, so many Star Wars and Simpsons references get flung around, they've had to develop a system to distinguish quotes from regular speech. It involves raising a hand while doing the quote so the listener will know which is being referenced and can either laugh along or safely ignore it. The problem with this system is nobody seems to remember which hand is for Simpsons reference and which is for Star Wars. Pete and Alex have identified a number of Imperial characters that, due to their inconsistent actions at certain points in the movies, may be rebel spies, moles or sympathisers. Pete strongly believes that the original version of Star Wars is the best so the other hosts say "Sorry Pete" when they mention the Special Editions and Prequels. One of the other hosts (usually Joe Dator) suggesting that a change in the Special Editions of the Original Trilogy actually improved the movie. During podcast episodes about the Prequels, guest Joe Dator apologizing for mentioning the Original Trilogy. Alex considering apologizing any time they mention The Force because of Pete's belief that The Force does not exist. Any time the other hosts mention something that Pete doesn't like. When Alex refers to an early draft script - which is usually Pete's territory (see ESB 84). A derivation of "Sorry Pete" is when Pete himself mentions the prequels and says something like "I hate to bring up the prequels". "Sorry Pete" is part of the SWM Drinking Game. In case a theoretical person who is listening to the podcast has not seen the movies (somehow), the hosts helpfully alert the listener to potential spoilers. Since it is very unlikely someone would listen who wasn't already a fan of Star Wars, this is mostly done facetiously. Now that they have covered The Phantom Menace, they have more or less stopped doing this, as any potential spoilers have "happened already" (since TPM came out after the Original Trilogy). Staring... at the French horn. This came from SWM:WE 17. Alex's memory of marketing slogans is a little off. In scenes where Anakin's mother appears, whenever anybody uses the pronoun "she" to refer to her (starting with TPM 58), they will replace it with her name ("Shmi"). So instead of saying "He said, she said" they will say "he said, Shmi said." This was taken to extremes in an 8-DAY-GREEDO call from former guest of the show Dan Telfer from TPM 73. Before they agreed to do The Phantom Menace Minute, every time Pete and Alex would mention the name of the movie, something would go wrong technically with recording the podcast, and so they took to calling it "The Naboo Movie" the way professional thespians refer to the Shakespeare play Macbeth as "The Scottish Play". Now that they've finished their TPM coverage, it would appear that the "curse of The Phantom Menace" has lifted. Main article: What does it smell like? A question Alex is always asking, this has become a running theme in SWM. As Alex famously stated, it's a stinky universe! What is that in "Enterprises"? Main article: How big is it? This running joke started with Tim Kreider, who uses the Star Trek (Original Series) USS Enterprise as the standard unit of length. The Enterprise is nearly 1000 ft (289 m) long. Who were they in Superman (and other movies)? The guys also hosted a podcast called Alphabeatical where they discussed the Beatles catalog alphabetically. Occasionally, one of the hosts will drop a reference to the Beatles, which is from the wrong show. This has now extended to any other podcasts referenced: in particular ones that the hosts have appeared on. Has to look up a piece of trivia. Goes on an epic sidetrack about a topic (usually Alex). One of the hosts (also usually Alex) will ask Pete to cut that bit out of the show. The fact that we know this means that the bit was not in fact cut out, and this has become something of a running joke. Especially given that Pete almost always responds with "No, no" or something similar. It was revealed in the Live Listener Q&A that Pete, who does the editing, rarely cuts things out of the show. As discussed in ROTJ 42, something to do with the Force is always involved in minute 42 of each movie. Therefore, the number 42 is code for The Force. This page was last modified on 27 January 2019, at 23:21.